To Apollo's Leon Black, Credit Markets Are In "Bubble Status"
One week ago, an increasingly gloomy Morgan Stanley (which recently called the start of a bear market for US stocks) issued its 2019 credit forecast, which was a scathing preview of the challenges facing both HY and IG credit: "the credit bear market, which likely began when IG spreads hit cycle tights in Feb 2018, has begun and will continue in 2019, with HY and then eventually loans underperforming, as headwinds shift from technicals to fundamentals." Now the Wall Street titans are joining the call. "The amount of covenant-less debt is more than 2007. You have a thirst for yield that exists on a global basis. So there is true excess." So since it's a bubble, and it is - still - a seller's market (but that is changing fast) Black said that in this environment his private equity business tries to get as much covenant-lite as possible, and fixed rate debt. And of course, Apollo takes the opposite approach in its credit business where the firm makes sure to have covenants. "We try to play a more conservative, cautious role in a bubble environment," said Black, noting that the PE firm’s credit and insurance operations offer the most growth potential. 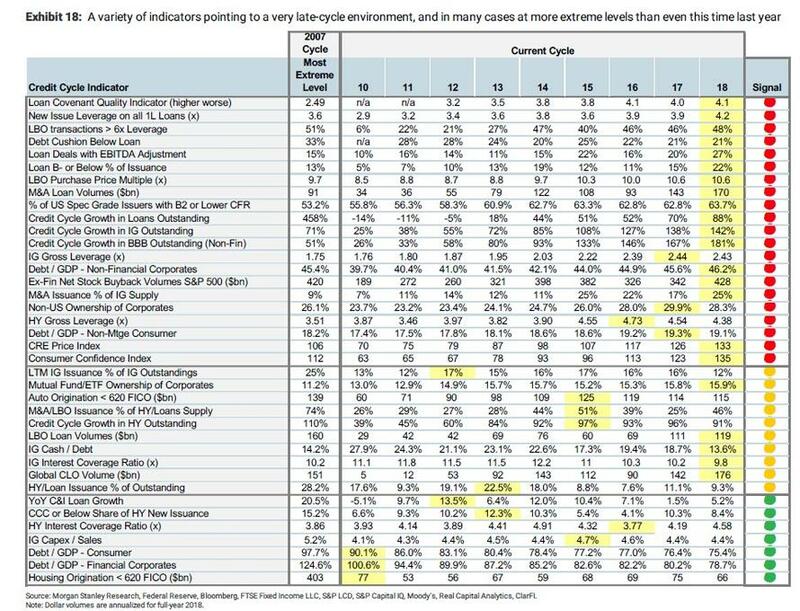 Finally, here is the Morgan Stanley credit cycle - or as Black might call it "bubble" - checklist. As the bank puts it, "a variety of indicators pointing to a very late-cycle environment, and in many cases at more extreme levels than even this time last year."